Cut peat blocks were already being used for building houses thousands of years ago. Now, scientists at the University of Tartu in Estonia have developed a material which could make it possible to print energy-efficient houses out of milled peat and oil shale ash using a 3D printer. A couple of years ago, Dr Jüri Liiv invented an organic humate soil improver, TURPS, made from peat, poultry manure and wood ash, which makes plants grow faster and increases the fertility of soil. When testing which granules have suitable hardness, he began to consider whether peat could be used to produce a self-supporting construction material. Today, Jüri Liiv can say for sure that it is possible, writes Universitas Tartuensis, the magazine of the University of Tartu. 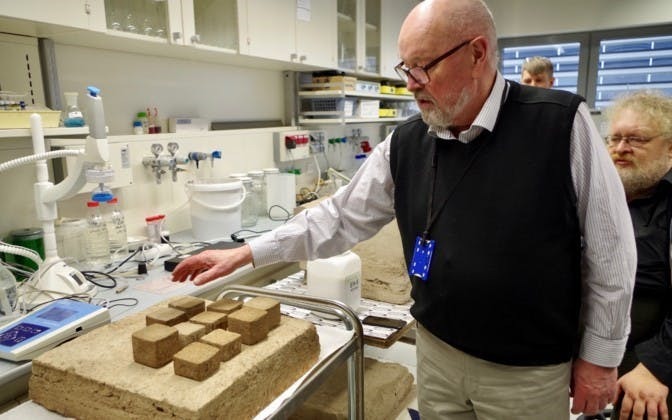 In collaboration with scientists from the University of Tartu and the Estonian University of Life Sciences, he has created a construction material consisting primarily of peat and oil shale ash which may reduce the construction costs of a private house nearly tenfold. The aim was to create such a self-supporting construction material based on local natural resources and waste that could be used to 3D-print houses that are up to two-storeys high directly on the construction site. The Environmental Investment Center funded the scientists’ project with approximately $230,000. According to the Estonian Wetland Society, wetlands cover almost 22% of Estonia’s area and only a third of this is being used as peat deposits. Less than a third of the examined peat reserves are considered usable reserves and about 2% of these have an extraction permit. This means that even though there is enough peat in Estonia, an extremely small amount of it gets used. So far, only the drier top part of the peat layer has been deemed usable. The thickness of the peat layer of larger wetlands is, 10–15 feet on average, sometimes 22–26 and, although rarely, even up to 60 feet. The unused part is left to decay. Ergo Rikmann, a PhD student of chemistry at the University of Tartu, does not like such waste. “This peat could also be used in an economically beneficial way. Many fractions can be separated from peat, for example humic substances and waxes, and the final residue can even be used for producing cellulose,” said Rikmann. In addition to a waste of resources, the current drained cutover peatlands create another problem: instead of binding carbon dioxide, they begin producing it themselves. And the amounts are not small. The most common way for mining peat is milling. During milling, a 10–20-mm layer is cut loose from the top layer of a peat deposit and left to dry on the milling field. When the cut part is dry enough, it is piled in stacks and the next layer is cut loose. For this method to pay off, most milling fields are larger than 100 hectares. When the top layer of a peat deposit is removed, what remains is a layer of highly acidic decomposing peat on which even peat moss does not grow. Measurements made in Sweden show that peat mineralises extremely fast on a milling field. This means that Estonia’s drained peatlands presumably release up to 10 million tonnes of carbon dioxide into the atmosphere every year. Growing peat, however, binds carbon dioxide. To get the peat growing again, the entire reserve of peat should be taken out during mining. In Finland, where peat is used in great amounts, the peat fields are actively restored; after the extraction of peat, the same place is sowed with peat moss. According to Liiv, Estonia’s peat deposits are generally thicker than those in Finland and restoring them would require more work. However, taking into account how widespread our peatlands are, their growth, if used sensibly, would be larger than we could utilise. “So far, no one has produced peat composite as a construction material because peat prevents many materials from hardening. In our project, we managed to overcome this issue,” said Liiv excitedly. Instead of the usual cement, scientists from Tartu use oil shale ash as the binder in their mix because it is the most excessive substance in Estonia. In all actuality, any ash could be used in the printing of the material. Oil shale ash is classified as a hazardous waste because it becomes very basic when in contact with water. The pH of drinking water is 7 but the pH of oil shale ash can be almost 13, which makes it harmful to the environment. However, ash with such a pH is the best fit for construction materials. If the pH of a pore solution is below 9, it won’t harden at all. This issue can be solved at a high pH by binding the potassium oxide and alkali metals found in oil shale ash to insoluble compounds. Inside the peat, oil shale ash reacts with humic acids and absorbs carbon dioxide. This means that, due to chemical reactions, the binder becomes regular concrete and limestone. When developing this novel construction material, scientists from Tartu carried out an abundant number of analyses which demonstrated that the material is completely harmless and safe for the environment. Furthermore, during testing, a solution was found for reducing the setting time from about 30 days to one day. In Estonia, it is estimated that about 7 million tonnes of oil shale ash are created in a year, only 5% of which is reused (for producing cement and for liming fields). The rest is deposited in ash hills and this creates considerable environmental pollution. Using such a peat material would definitely help reduce deposits of new ash. According to Toomas Tenno, chair of colloidal and environmental chemistry at the University of Tartu, nanosized additives, e.g. nanosilica or silica fume, are added to peat and oil shale ash to improve their properties. “As the particles are very small, they dissolve well and distribute throughout the material evenly. Silica fume improves the quality of this material significantly,” said Tenno. At first, recycled plastics were going to be used in the construction of peat houses for inserting a reinforcing armature inside the entire material. However, the newly created material turned out so well that it doesn’t need arming to stand up. Reinforcement is only needed for openings, arches and other special architectural solutions. The developed peat material achieves its initial hardness in 24 hours but remains elastic for a considerably longer time. Thus, there is no need for insulation or fillers and the entire structure becomes airtight without adding any wind protection. “It is a breathing material that does not need separate vapour or wind barriers. There should be no issues with mould. Furthermore, it is a good noise blocker. In Finland, peat is used for making acoustic panels and our material is just as suitable for this purpose,” explained Liiv. Tenno added that research took about a year before they found the right mixture for the material that is strong and has very good thermal insulating properties. After final hardening, the material is strong and very light, has low heat transfer module and is durable. Even though peat is also used as fuel, the material developed by scientists is incombustible. This material has more advantageous properties. Country houses often have issues with rats, insects and mould; the novel composition, however, is not favourable to any of them. Also, with this composite, there is no fear of grass or trees growing on the wall as the peat mixture used in plant production is entirely different. As peat and oil shale ash are not very expensive, house builders would be especially happy about the price of the material. According to Liiv, scientists calculated that the cost for the construction of a house shell printed from this material with a floor surface of 325–500 square feet could be about $5,800 (compared to the construction of the shell of a framed building of equivalent size, which would cost about ten times more). Thus, peat material could be used to build a very cheap house with an energy class A. It is already possible to print the internal or external finish onto the material while printing the building. The surface of the material is rustic and can be smoothed with plaster and painted, if desired. By now, the research, as well as many tests, has been completed. Issues with materials technology have been resolved successfully, but due to insufficient funding, the planned 27-cubic-metre test building was not printed. Peat material is essentially ready for manufacture as elements, but a lot of work still needs to be done for 3D printing. “Building a house from our material could look something like this: the foundations are laid and a vehicle with the printer drives to the site, bringing with it two or three loads of peat, oil shale ash and other additives. A two-storey house could be printed from these materials in one or two days,” describes Liiv. Modern industrial 3D printers print a layer of material up to 15 mm thick at once. This would make the work go fast. The only thing left to do on-site would be to manually install the plumbing and the doors and windows into the correct openings. The Estonian University of Life Sciences, where Tõnis Teppand helped conduct the mechanical tests, might buy such a printer from Voronež, Russia in the near future. With any luck, scientists could be continuing the applied research next year. Currently, they are waiting for a response to their application for financing. Funding is needed for continuing the construction-material project and for developing other branches deriving from it which require the use of peat. With the same technology, self-destructive blocks of a different composition can be prepared and used for pre-growing plants and, for example, creating compositions in urban landscaping. Scientists also hope to develop a technology for utilising hazardous waste. This technology would encapsulate all the harmful substances into capsules and either make them insoluble or process them into useful substances. Tenno added that they have also proposed producing activated carbon from peat. Results of initial tests look promising but there is no funding for this application.